Item allowance properties can allow for many items to be added as containers to other items with what might sometimes appear to be an overwhelming amount of flexibility. Using rules as to which items can be contained in other items can help to control the placement of items and reduce potential confusion as to where content should be placed. An example which is often thought of as too much flexibility is the ability to add a folder to a file, which is the reverse of the files-in-folders structure which is familiar to most people. Items allowed is often set at the root level of the system to set rules as to the item relationships which are inherited throughout the global system. 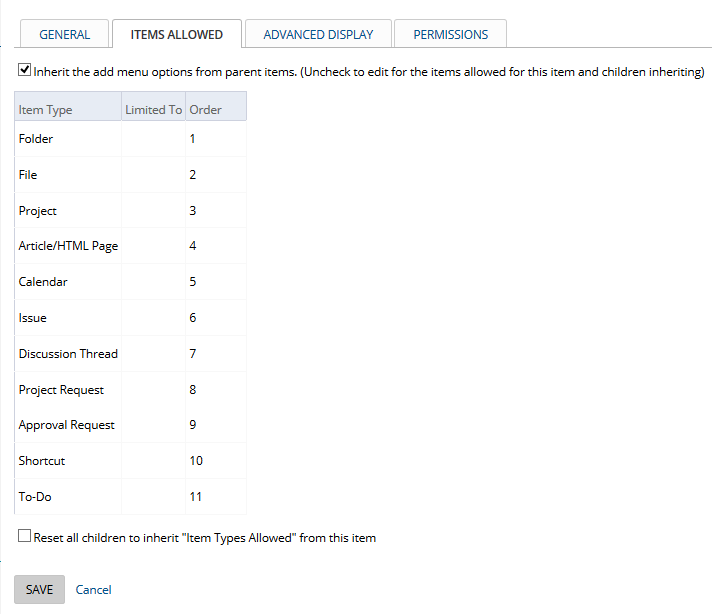 Exceptions to the rules of these settings in any item can be made for that item's child items by using this same interface within the specific item. Inherit the add... can be unchecked to set exceptions.for child items of any item. Item Type lists items which may be set for rules within the Project Insight system that could be allowed to be added to this folder. In most cases, allowing Articles, Files and Messages is sufficient. Click to check the box next to the item types you'd like this folder to contain. Reset all children to inherit... will force the inherit rule on all child items from this parent. This setting has no purpose for new items because child items are automatically set to inherit without this setting. It is only used to reset all child items if the parent item might have many child items which have been changed for exceptions in the past and you would like to force the inherit rule back to inherit through all of the child items. The check box will force the inherit settings and then immediately un-check itself upon saving the item so that you never see this box checked when first opening up the Items Allowed tab through any add or edit action.